STUDIOS Architecture is redesigning the offices of Nickelodeon over six floors of 1515 Broadway in New York City. Phase 1 of the project has been completed with the second currently in process. The network currently occupies their space in the building which meant the project would need to be completed in phases to minimize disruption to work. 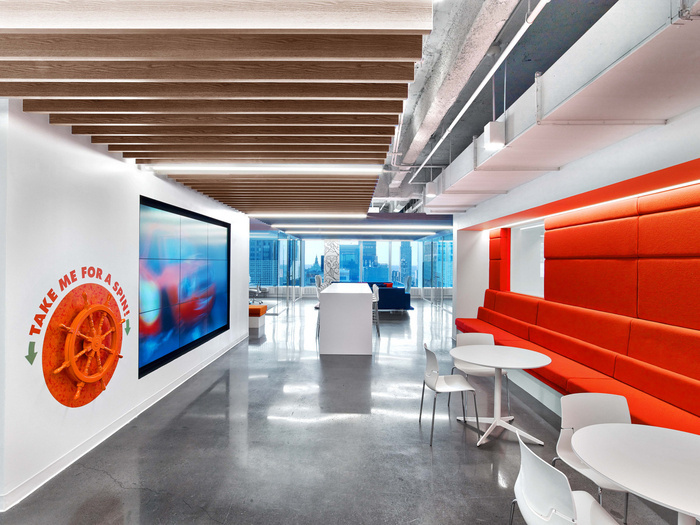 Nickelodeon, a media company targeted toward children and families, wanted a grown­up space that maintained their vibrant, expressive, and fun nature. Key design elements include increased exposure to views and daylight, making leadership more visible, assigning private offices based upon need rather than title, and informal “refresh and connect” areas to foster a sense of community. We introduced storage solutions on each floor to maximize space and eliminate clutter.